Each is equipped with a super comfortable mattress and a cosy wood-burning stove - leave your sleeping bags at home! Individually designed, both tents are completely original - with their own identities. The original Red Kite Tree Tent, Ynys Affalon, was the first Tree Tent glamping hotel ever installed in the UK. 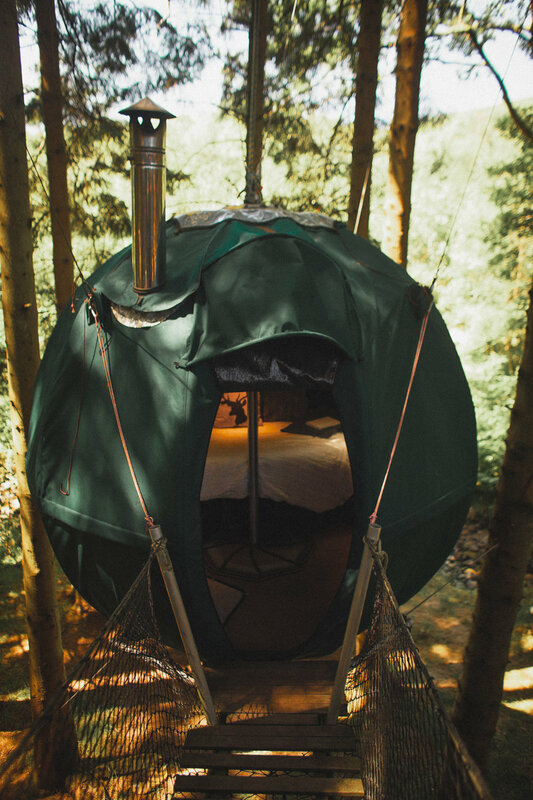 Since it was featured on Channel 4 on George Clarke's Amazing Spaces, and in Condé Nast Traveller, the forest green orb has had five rocking seasons with hundreds of happy glampers. 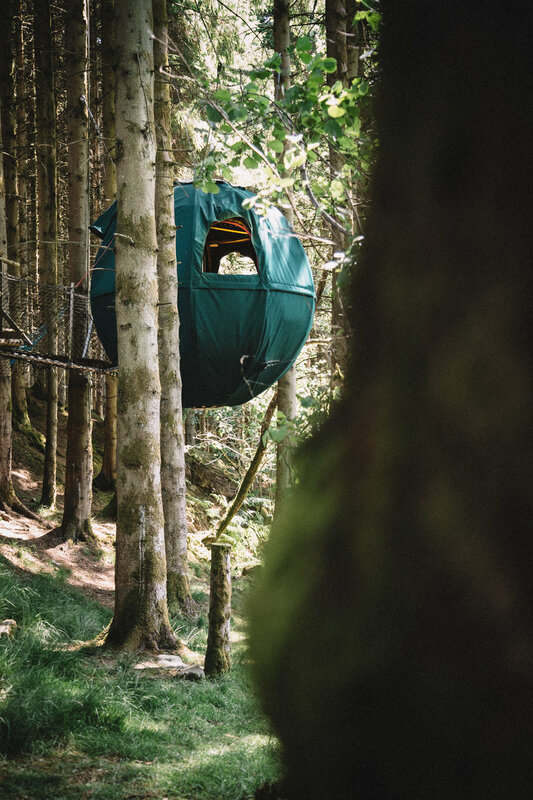 New for Summer 2018 we launched Dragon's Egg, nesting even more mystically high up in the canopy. Enjoy remote glamping in mid Wales. Cocooned in your own peaceful private forest, both Red Kite Tree Tents offer a magical escape for those seeking a break surrounded by nature. Owner Anjana says, "I love picking up a newspaper, cooking a wood-fired bacon sandwich on the fire pit and spending the morning relaxing on the deck reading and listening to a nest of hatching birds on the trees beside." The two tents are a couple of hundred metres away from each other. Each has its own access track, log bridge and facilities so you can be completely private. Yet there is also potential to book both tree tents for a unique couples' or friends' retreat. Staying at the Red Kite Tree Tents allows you to enjoy the the escapism of the wilderness without the punishment of camping! Enjoy the simple things in life, without compromising on basic comforts. Both of our globe-shaped pods were built using materials and techniques borrowed from the aviation industry: steamed ash, aluminium, lightweight insulation. You will find your tent hanging in the canopy, suspended by high-tensile wires and ropes from mature trees. The tents are covered with thick canvas and are fully insulated. Both are equipped with soft foam mattresses and a double bed which folds into a sofa during the day. Inside there is a cosy wood-burning stove (fully fire-proofed of course). Cross the drawbridge to the deck and you will find a well-equipped outdoor kitchen with gas hob and cooking utensils. On the deck are also your shower cabin, with hot water shower; just up the hill is a separate cabin with flushing toilet. The Red Kite Tree Tents are about unplugging and escaping everyday life. Listen to the river tumbling over the mossy rocks and gliding beneath the log bridge. Watch red kites rising on the thermals above and the hares boxing in the valley below. On arrival you will find bed linen, towels and dry wood and kindling for the stove. You can walk straight up into the hills behind the forest: the estate lies on the edge of the remote Elenydd region of mid-Wales. The nearest shops are about 10 minutes' drive away in Newbridge-on-Wye, where you will find a well-stocked post office convenience store, artisan butcher, and the charming local. There is a large 24 hour supermarket in Llandrindod Wells. Ynys Affalon and Wy y Ddraig Tree Tents are situated on our private conservation estate in Powys, near Builth Wells and Newbridge-on-Wye. You can walk straight into the green mountains of the Elenydd, right behind the estate. Access to the Tree Tents is via a private track off the B4358 road at the village of Llanafan Fawr between Newbridge-on-Wye and Llanwrtyd Wells.